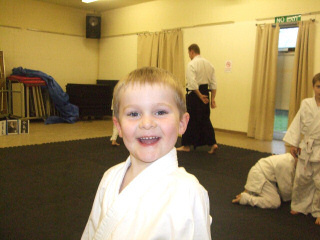 The North Cotswolds Aikido Club does not currently hold classes for kids (ages 8+) but if you have a child that would be interested in these classes please get in touch and if sufficient interest is shown then we will look into the possibility of providing them. 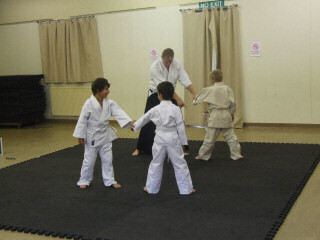 Below are details of the AI-KID-DO classes held at the Bicester Aikido Club. 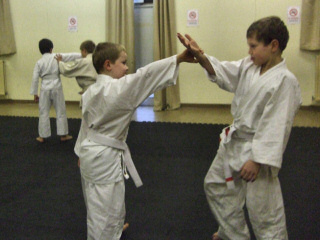 As well as being taught practical self-defence, the children also learn self-discipline and learn to think about their actions and the value of conflict resolution through non-aggressive means. Aikido does not require athletic talent. Aikido works for small people since it does not rely on size, or speed, or weight and is based upon movement that originates from the 'tanden' or 'centre' (a dynamic point of focus in the lower belly), and this understanding of movement can benefit all types of physical activity with the development of coordination, posture and balance. 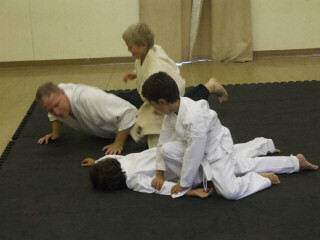 As a parent you will probably be grateful that aikido is completely self-defensive. It involves dealing with punching, kicking and aggression from others, not actually applying (and making kids better at) kicking and punching. Over time, children learn to sense aggression in others and develop a range of skills in diffusing aggression and conflict. Aikido teaches "how to be strong" and how learning to stay calm and relaxed can be much stronger than things like anger, force and aggression. They learn about responsibility, doing the right thing, even without reward and about treating each other with respect and kindness. 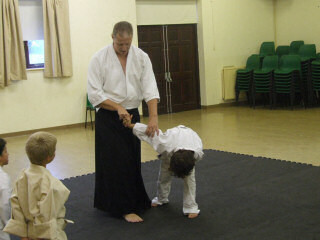 In the practice of Aikido it is necessary to learn the skill of Ukemi, the art of safe falling. We fall many times in our lives - from horses, bikes, skateboards etc. Like swimming, ukemi is a lifeskill that can, and has on many occasions, saved people from bad injuries. The key to making progress in aikido is perseverence and having a positive attitude, what better lesson can we teach our children? 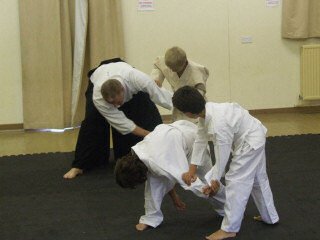 The instructors at Bicester Aikido Club voluntarily give of their time to facilitate this training. 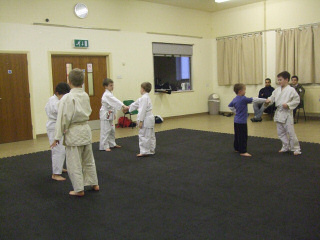 All fees are purely to cover costs of hall hire and insurances etc. All instructors are CRB checked. Below are comments received from ai-kid-do students' parents. Stow on the Wold, Moreton in Marsh, Bourton on the Water & Chipping Norton covering North Gloucestershire, West Oxfordhire and South Warwickshire.